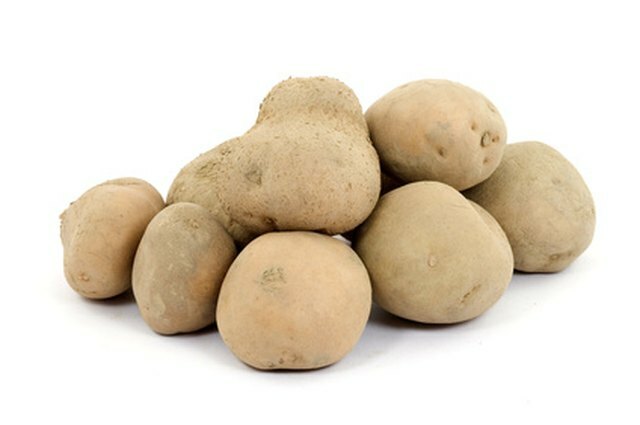 Potatoes provide high levels of potassium, fiber and iron in a fat-free package. In addition, a medium potato has less than 150 calories. Baking prepares the potatoes without any added fat and makes a filling meal or side dish. 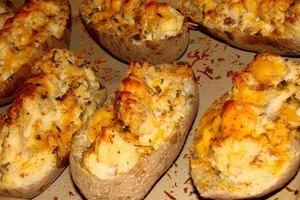 To save energy or to serve a number of people, bake several potatoes at once. You can cook as many potatoes as your oven will hold, but the potatoes will cook more evenly if you leave space between the potatoes for air circulation. Turn your oven to 425 degrees F. While the oven preheats prepare the potatoes. Wash each potato under cool water. Use the vegetable scrubber to remove any dirt from the potatoes. Pierce each potato several times with a fork. If you want baked potatoes with a crisp outer peel leave the potatoes unwrapped. If you want potatoes with a moister texture and softer peel, wrap each potato in a small sheet of foil. Space the potatoes on a rack in the preheated oven so there is at least an inch of space around each potato. In a standard oven you should be able to have three rows with five potatoes in each row. Bake the potatoes for about 50 minutes. Use an oven mitt to remove one potato to test it. 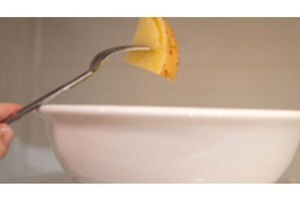 The potato is done if it feels soft and has a tender feel when you pierce it with a fork. If the potato is not done, put it back in and cook an additional 10 minutes. Turn off the oven, remove the potatoes with the oven mitt and allow them to rest for 10 minutes before serving. 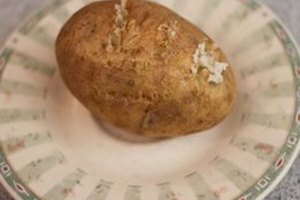 Leftover baked potatoes can be reheated in the microwave. Remove any foil first. For a healthy meal, use low-fat toppings on your potatoes such as plain yogurt, beans or steamed vegetables. Don't peel your potatoes before you bake them. Open the oven door slowly. Steam from the potatoes can burn your face.